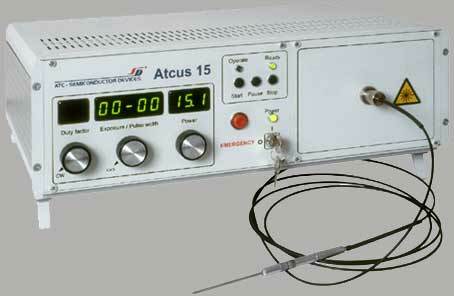 ATC-Semiconductor Devices presents recently developed ATCUS series laser devices. Each device consists of the optical block, electronic control block, optical instrument and foot pedal. Optical block is the optical-mechanical unit consisting of a few laser diodes with focusing objectives, optical socket, Peltier-element with thermistor. Electronic control block controls the operation modes of the optical block. Electronic control block includes a few control channels (for each laser diode). Protection for the laser diode. Optical instrument delivers optical radiation. Foot pedal allows remote switching the laser on and off. Warranty service of 12 months. Training of experts. Methodical, license and information support. Dermatology including vascular pathologies, dysplasia, wine stain, haemangioта, vascular stars. Tongs for removal of the housing fibers. Intense training, in all medical directions mentioned above, will be carried out on the basis of faculty " Low-invasive rekonstruktive-plastic and laser surgery " of Saint Petersburg State Medical Academy in the name of Mechnikov I.I. together with Saint Petersburg and Northwest Centre of laser medicine. Laser technologies can play a main role in treatment of the oncological diseases of various localisation. The most effective are the photodynamic therapy (FDT), the selective laser hypеrthermia (SLH), and also a combination of these methods. 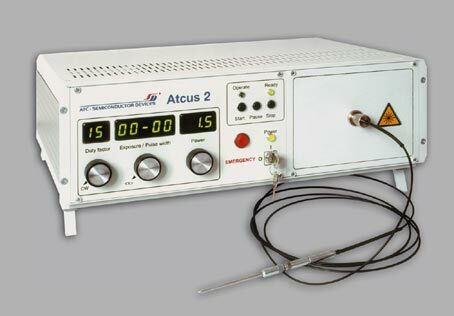 For realisation of these methods laser devices " Atcus-2 " (FDT with use of the newest domestic photosensibilizer of the second generation - Fotoditazin), " Atcus -15" (SLH) and " Atcus -10" (combination of FDT and SLH) are created. The photosensibilizer Fotoditazin prodused by firm Veta-Grand. In some cases, when the traditional methods of treatment are not applicable due to certain reasons, the laser treatment could be the only way. Clinical testing of the semiconductor laser device "Atcus-15" were held in the St.-Petersburg Scientific research institute for oncology named after N.N. Petrov of the Ministry of Health of the Russian Federation. Basing on their results the patents of the Russian Federation (№ 2122452, № 2134603) for treatment of neoplasms with the selective laser hypеrthermia method were received. St.-Petersburg Medical University named after Academician I.P.Pavlov (otolaryngology). Main advantages of Atcus-15 are high accuracy and precise control during the operation, smaller post-operative edema, considerable decrease of bleeding and pain, simplicity of service and usage of the laser, and finally, its low price, which increases economic efficiency of the laser cabinet. External air- or water-cooling is not required for operation of the laser.